A couple of weeks ago, I took a look at the first of three versions of the Imperial Speeder Bike released by Kenner in their Power of the Force II line. 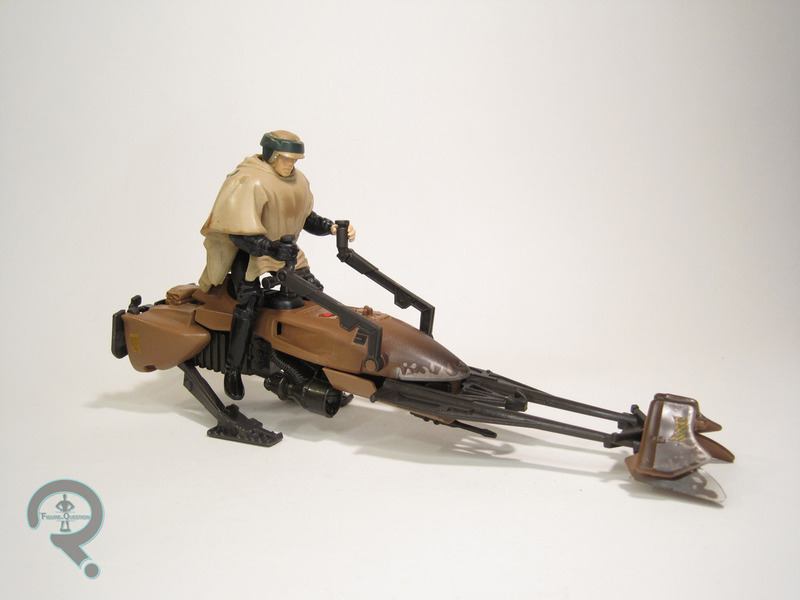 The vehicle’s mold was first introduced in the vintage Return of the Jedi line, and was then re-packaged in the ’90s, with one of three different pilots. I’ve already looked at the one with Leia. Today, I look at her brother Luke, alongside his own Speeder. The speeder bikes in these sets were all identical, meaning this one is exactly the same as the one I looked at alongside Leia two weeks ago. I liked it then, and I still like it now. I imagine I’ll still like it when I get around to the third variant of this set. Like the Leia figure included with the last one, this one has an Endor variant of Luke Skywalker. Luke spends a little bit less of his time in this gear, but it’s still a fairly distinctive appearance for the character. Like Leia, it had previously appeared in the vintage line, but this was the first we saw of it in this re-launch. It would also be our only Endor Luke for a little while, as figures of him from Jedi tended to go for his, well, Jedi appearance. As such, this figure’s sculpt would remain completely unique to him. He stands 3 3/4 inches tall and has 7 points of articulation. Check out those sweet knee joints! That was a pretty huge deal. Luke’s head is rather similar to the Endor Rebel trooper, not only with the same helmet, but also a rather similar facial structure. This Luke’s sculpt was notable for not including his outer vest; he was not the only version of Luke to omit it in this line, but he was the first one. Like his sister, Luke has a removable rubber poncho piece. This one’s not quite as nice. It isn’t very well fitted to the figure, making him look really pudgy. It also lacks the nice, subtle paintwork, meaning it’s just a lot of unpainted tan plastic. This guy was packed with a variant of the green lightsaber included with the basic RotJ Luke, though this one was wider than that one so that his slightly enlarged grip can still hold it. 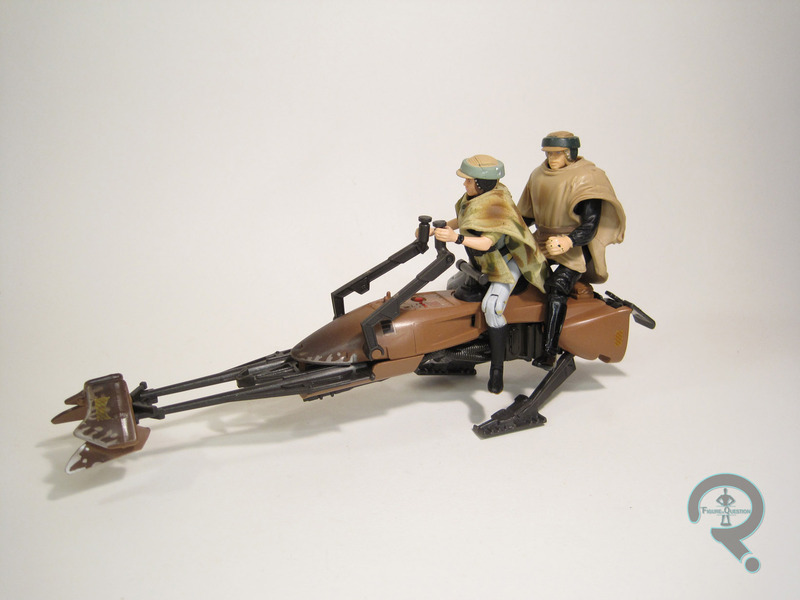 As a kid, I only had one Speeder Bike, and it was this one. I was definitely a Luke kid, so I needed to have another version of him, and the Endor one was one of my favorites. That being said, I remember the actual figure didn’t get a ton of use; instead he was robbed of his poncho and speeder, which I gave to my standard Jedi Luke. Looking back at this figure, I kind of remember why that was the case. He’s not a bad figure, but he’s not as strong a figure as the Leia.